Why have our drug wars failed and how might we turn things around? 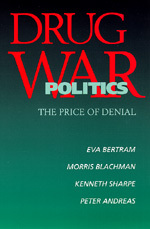 Ask the authors of this hardhitting exposè of U.S. efforts to fight drug trafficking and abuse. In a bold analysis of a century's worth of policy failure, Drug War Politics turns on its head many familiar bromides about drug politics. It demonstrates how, instead of learning from our failures, we duplicate and reinforce them in the same flawed policies. The authors examine the "politics of denial" that has led to this catastrophic predicament and propose a basis for a realistic and desperately needed solution. Domestic and foreign drug wars have consistently fallen short because they are based on a flawed model of force and punishment, the authors show. The failure of these misguided solutions has led to harsher get-tough policies, debilitating cycles of more force and punishment, and a drug problem that continues to escalate. On the foreign policy front, billions of dollars have been wasted, corruption has mushroomed, and human rights undermined in Latin America and across the globe. Yet cheap drugs still flow abundantly across our borders. At home, more money than ever is spent on law enforcement, and an unprecedented number of people—disproportionately minorities—are incarcerated. But drug abuse and addiction persist. The authors outline the political struggles that help create and sustain the current punitive approach. They probe the workings of Washington politics, demonstrating how presidential and congressional "out-toughing" tactics create a logic of escalation while the criticisms and alternatives of reformers are sidelined or silenced. Critical of both the punitive model and the legalization approach, Drug War Politics calls for a bold new public health approach, one that frames the drug problem as a public health—not a criminal—concern. The authors argue that only by situating drug issues in the context of our fundamental institutions—the family, neighborhoods, and schools—can we hope to provide viable treatment, prevention, and law enforcement. In its comprehensive investigation of our long, futile battle with drugs and its original argument for fundamental change, this book is essential for every concerned citizen. Eva Bertram is a public policy analyst and organizational consultant in Washington, D.C. Morris Blachman is Associate Professor of Government and International Studies at the University of South Carolina. Kenneth Sharpe is Professor and Chair of Political Science at Swarthmore College. Peter Andreas is a research fellow at the Brookings Institution.